There are many factors effect the success of organizations and projects. Selecting the most profitable project alternative, having a well defined mission, possessing an innovative vision, selling a product that is in high demand, using technology are some of them. Beyond these, a company’s organizational structure plays a key role for it’s success. An organizational structure provides a system that defines hierarchy and reporting lines within the organization. Departments and their functions, reporting hierarchy, relationships are defined during the development of an organizational structure. This article discusses the different types of organizational structures and their outstanding features. Why an Organizational Structure is Needed? Organizations are established in typical ways to reach different targets, and the structure of an organization can expedite or complicate its progress toward reaching these targets. In an organization without structure nobody knows whom to report and unclear roles and responsibilities can cause issues. There are many different types of organizational structures prepared in organizations. The types of organization structures depend on many factors, such as type of organization, work flow, hierarchy and leadership style. Poorly designed organizational structures create confusion and reduce the quality of decision making within the organization. What are the Types of Organizational Structures ? There are various types of organizational structures that represent different companies hierarchial reporting system. Also other classifications can be done but in this article we are using the The PMBOK Guide classifications. A Functional Organization structure is also known as a bureaucratic organizational structure which divides the company into depatments such as marketing department, engineering department, sales department etc. Most of the organizations are divided into specific departments and teams to perform specific roles. Each department has a manager and the team members work under the supervision of department manager. Likewise each department manager reports to a higher level manager who supervises multiple departments. For example a manager of research-development department supervises the team members and reports to a vice president who is responsible for research-development operations. One of the advantages of functional organizational structures is that team members are grouped by their skills and functions within the organization. The team members use their energies and expertises to perform their roles as a team. A disadvantage of functional organizational structures is that there is a lack of communication between the functional departments. Most of the discussions take place at department managers or higher levels. 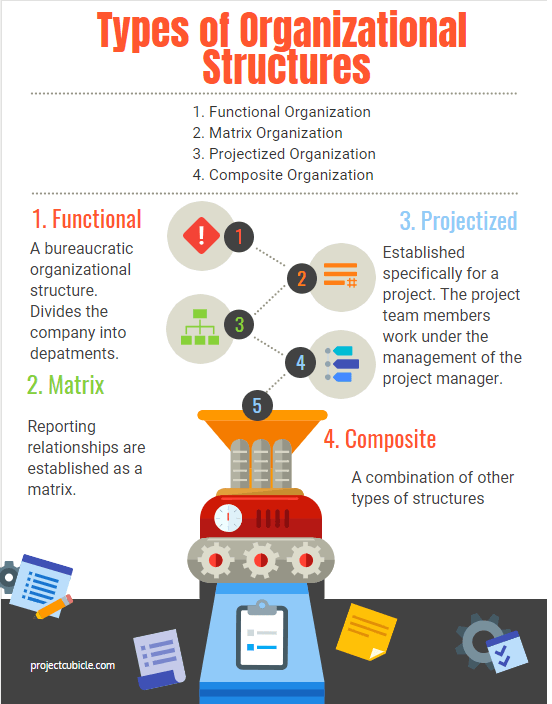 A Matrix Organization structure has the characteristics of both functional and projectized organization structures. Employees report to multiple managers depending on the requirements. For example a project control engineer is working under the supervision of project control manager. But the company is preparing an offer for a specific project and the engineer’s knowledge is needed. During the preparation of the offer, the engineer both reports to his manager and the bidding manager. A Matrix Organization structure is a company structure in which the reporting relationships are established as a matrix. An employee may have vertical and horizontal reporting lines. Also an employee may be part of multiple departments and may have multiple managers. Matrix organizational structures allow employees to share their expertise and decisions across the departments. However reporting to multiple managers may cause confusion and employee dissatisfaction within the organization. Matrix organizational structures can also be categorized as strong matrix, weak matrix and balanced matrix based on the role and authority of the project manager. Projectized Organization structure is established specifically for a project. The project team members work under the management of the project manager and they report to him. When the project has completed the whole team will dissolve. The project manager has all the authority to manage the team and achieve the goals. Reporting directly to the project manager reduces conflicts and speed ups decision making within the projectized organization structures. Arising from the power, project managers may become arrogant and this damages the communication lines. Another disadvantage of this structure is that the cost of equipments and employees may be higher because they are employed for a short period of time. Composite Organizational Structure is a combination of other types of organizational structures. A composite organizational structure may include two or more than two structures in a special project. For example a corporation with a functional organization structure needs a new head office building. The corporation decided to build the head office itself. Therefore a seperate organizational structure is created in relation to the corporation’s organization structure. Then the corporation’s organization structure became a composite organization. All the companies and organizations are different than eachother. Each organization has it’s own characteristics and function. Therefore an organization must select the type of organization structure which suits best to it’s managerial requirements. Organizational structures and reporting hierarchy must be established in all organizations in order to eliminate communication problems. Poorly established organizational structures may cause confusion within the roles and troubles within the organizations. Organization structure is important for an organization productivity. Successfull companies have strong organization structures and reporting systems. In this article we take a glance at different types of organizational structures. We hope it will be useful for project teams and PMP aspirants.